Select a battle from the scenario book. First time players should play the first couple of scenarios “Opening Action 1” and then “Opening Action 2”. These are non-historical scenarios and are expressly designed to introduce players gradually to the basics of WWI trench warfare. 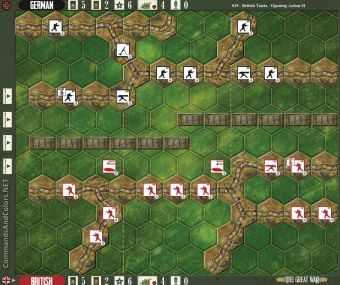 Place the terrain hexes and wire tokens on the battlefield, as indicated by the scenario map. Place the units onto the battlefield, matching the various units’ positions to the scenario map. Each unit symbol on the map represents an entire unit of figures on the battlefield. Shuffle the command card deck thoroughly and deal the number of command cards to each player, as indicated by the scenario notes. Keep the command cards a secret from the opposing player. Set the remaining deck of command cards facedown alongside the game board. Shuffle the combat card deck thoroughly and deal the number of combat cards to each player, as indicated by the scenario notes. Keep the combat cards a secret from the opposing player. Set the remaining deck of combat cards facedown alongside the game board. Set the WWI battle dice, targeting dice, targeting templates, and the Victory Medal tokens alongside the battlefield near the deck of command cards. The starting player will roll the shelling of No-Man’s-Land. 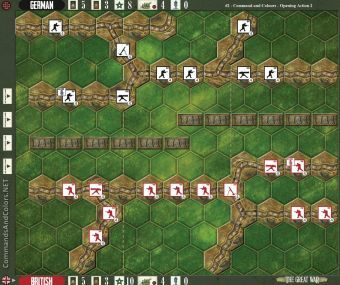 The scenario map will indicate with a series of arrows at the side of the scenario map, which rows are No-Man’s-Land rows and will be shelled. Starting with the row closest to enemy, one targeting die is rolled. Counting each hex, going left to right, place a crater on the hex of the number rolled. Roll the die again. Starting with the next hex in the row, count the hexes and place a crater on the hex of the number rolled. Repeat this procedure until the number rolled takes the count off the right side of the battlefield. Working toward the starting player, complete the same procedure for all rows indicated as No-Man’s-Land. When it is a countryside hex, place a shell crater on the hex. When wire is on a hex, the wire token is removed and a shell crater is placed on the hex. The wire token can be flipped over so the image of shell crater is showing. When a unit or any terrain is on a hex, the hex is still counted, but no shell crater is placed.